Posted on Mon, Apr 9, 2012 : 5:56 a.m.
“Food is my passion.” That is what Sam Nemer has to say when asked about running Ann Arbor’s Roma Bakery. As owner, he is there seven days a week, and has noticed a steady growth in customers since the bakery’s opening almost six months ago. Owner Sam Nemer in front of Roma Bakery at 4837 Washtenaw Ave. in Ann Arbor. Roma Bakery opened at 4837 Washtenaw Avenue, in a stretch that has seen a number of restaurants come and go in recent years. Nemer says he really liked the Ann Arbor property when he found it; Roma Bakery’s Ann Arbor site is the second location for the growing business. After years using his business degree as a general manager at Art Van Furniture, Nemer resigned to pursue his passion: food. He went to The International Culinary School at The Art Institute of Michigan in Novi and opened Roma Bakery Ann Arbor shortly after graduating. He makes all of the pastries and bakery items himself on site. Traditionally, Roma Bakery’s specialty has been its grab-and-go pepperoni roll, but Nemer has attracted a steady clientele by offering both Italian and Middle Eastern favorites. ” Nemer continues naming some of his favorite menu items. The menu items are priced frugally; lunch combos for $4 and $5, and homemade bakery items priced from 50 cents to $3. 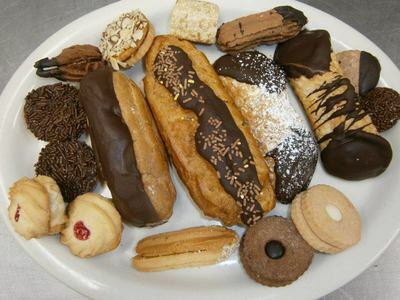 Eclairs, cannoli, and other sweets from Roma Bakery in Ann Arbor. “Business has been challenging, but promising, too,” Nemer says. “A lot of people still have not found us, but that is beginning to change.” Roma Bakery has recently begun to cater, most recently, weekend events at Eastern Michigan University. Roma Bakery has three full-time and three part-time employees, but is not financially viable yet, according to Nemer. But Nemer says he plans to persist until he finds success in the Ann Arbor location. now this is something that would be nice on the westside. Even in the location of Miller and Maple in a new building thats been vacant a number of years or to get some new life into the miller maple market. I would suggest Sam try to get some wholesale accounts with either Knights Market or Sparrow Market or Sweetwaters, his pastries would then be at my regular places. Mon, Apr 9, 2012 : 6:44 p.m.
Good luck Sam. But &quot;east of U.S. 23&quot; and &quot;Ann Arbor location&quot; are mutually exclusive terms in my world view. That's drive-by land. If you were actually in Ann Arbor, with foot traffic, and sold those nice pastries and espresso, you'd be killin' it right now. Mon, Apr 9, 2012 : 4:09 p.m.
Mon, Apr 9, 2012 : 4:24 p.m. It's just west of Golfside, on the north side of Washtenaw. I've added a Google map to the story. Mon, Apr 9, 2012 : 4:07 p.m.
Sam, I grew up as a kid eating the Pepperoni Rolls at Roma Bakery. Do yourself a big favor and get back to the original recipe instituted by the original owners. I wish you success. Mon, Apr 9, 2012 : 3:45 p.m.
Look forward to checking it out! Never would have known they were there...thanks for the article! Mon, Apr 9, 2012 : 2:32 p.m.
Due to the location and the fact that they close at 6 PM on weekdays, there is no way I can get out of work and drive there before they close. Yelp seems to love it, so that's good enough for me to check it out! Mon, Apr 9, 2012 : 2:03 p.m. The Roma Bakery in Dearborn is fantastic. Have had many quick, cheap breakfasts and lunches from there. Looking forward to visiting the new location, too. 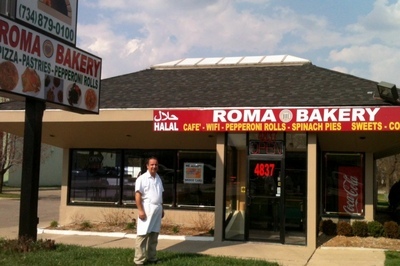 Mon, Apr 9, 2012 : 1:30 p.m.
Good Luck to Roma Bakery, we needed. Those of us still yearning for Quality Bakery. Wishful thinking. Mon, Apr 9, 2012 : 12:35 p.m. This sounds like a place worth checking out. If they stick to &quot;service, quality, cleanliness&quot;, as Nemer says, they will be able to keep a loyal following of customers. Good luck with your bakery. Those pastries look very tempting - I think I gained a few pounds just looking at them. Mon, Apr 9, 2012 : 12:22 p.m.
Good to see a bakery in the area as there seem to be very fewe true bakeries in existence. It is confusing when businesses are identified as &quot;Ann Arbor&quot; when they are actually in a different community. This bakery was reviewed in the Frugal Friday series where a helpful map identified the location as on Washtenaw near Golfside in Ypsilanti Township. That article, however, gave the address as &quot;Ann Arbor MI 48108&quot; while the Google map utility identifies it (I think correctly) as Ypsilanti 48197. This current article refers consistently to &quot;Ann Arbor&quot; without otherwise identifying the location (other than providing the street address). Mon, Apr 9, 2012 : 4:29 p.m.
You have the post office to thank for the &quot;confusion.&quot; As Brad points out, the business is located in Pittsfield Township. The city name that gets included as part of any address refers to the POST OFFICE that handles the mail for that location, not the municipal designation of the intended recipient's physical location. In this case, Roma Bakery - according to the Post Office is located at: 4837 WASHTENAW AVE ANN ARBOR MI 48108-3437 The business has an Ann Arbor address, as do ALL businesses on both the north and south sides of Washtenaw Avenue between Carpenter and Golfside because the Ann Arbor Post Office (48108) handles the mail for those addresses. To illustrate, the Post Office confirms the address of the BP station at Golfside and Washtenaw as: 4975 WASHTENAW AVE ANN ARBOR MI 48108-1413 and the address of the Marathon station across the street as: 4970 WASHTENAW AVE ANN ARBOR MI 48108-1414 These businesses are the easternmost addresses on Washtenaw Avenue that have an Ann Arbor address. The K-Mart, just across the street, has an Ypsilanti address because its mail delivery is handled through the Ypsilanti Post Office. Mon, Apr 9, 2012 : 2:17 p.m.
No, directly across the street is also Pittsfield Twp, it just has an AA mailing address and still isn't AA. Mon, Apr 9, 2012 : 1:22 p.m. Ad fjord said, directly across the street is Ann Arbor so I wouldn't call Roma a &quot;different community&quot;. Mon, Apr 9, 2012 : 12:47 p.m.
Ms. Armentrout is correct. Places have names, and that place isn't Ann Arbor. You can be sure if they were reporting a crime in that same location it would suddenly become Ypsilanti. Mon, Apr 9, 2012 : 12:41 p.m.
That stretch of Washtenaw is the boundary between 48197 and 48108. Roma is in 48197, but its neighbors across the street are in 48108. They're all part of Pittsfield Township, and are within the Ann Arbor school district, though Roma would have an Ypsilanti mailing address and businesses on the south side of Washtenaw would have Ann Arbor mailing addresses. See? Not confusing at all. Mon, Apr 9, 2012 : 11:45 a.m. I have visited Roma Bakery many times and have enjoyed eating the fresh, out of the oven bread. I love the spinach pies, pepperoni rolls and meat pies. Very good!!! The place is well maintained and very clean. You can eat lunch their or take it to go. Roma Bakery is a place where you have to just check out if you want real homemade food. Love it!! Mon, Apr 9, 2012 : 11:39 a.m. Thanks for an article about a cool business I had never heard of; I look forward to checking it out soon! They sound great!! Mon, Apr 9, 2012 : 11:01 a.m. The folks at Roma and the owner are super-friendly and accomodating, and the baked goods are superb. Mon, Apr 9, 2012 : 10:41 a.m. I love bakeries like the Roma. Too bad I don't live in that part of town. We need something like that on the west side of town. Mon, Apr 9, 2012 : 10:36 a.m.
Will have to check it out. Best wishes to the Bakery and hope that business continues to grow.